I thought it was fitting after publishing yesterday’s post about my boy growing up, that when I arrived to pick him up at work in the afternoon he was all excited to show me what he’d accomplished. I was a bit surprised when we walked right past the chicken coop he’d cleaned, the holes he’d dug for fence posts and the white picket fence he’d painted. 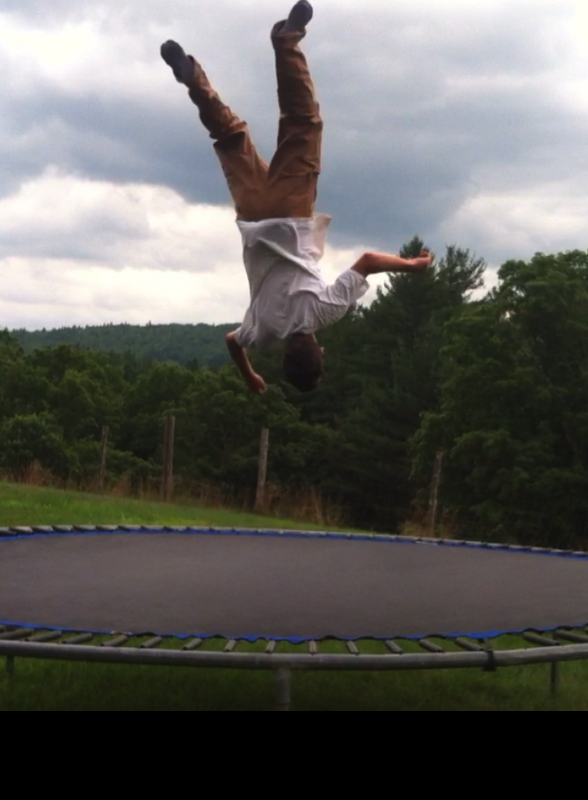 Instead, we went around the farm house to the trampoline in the field behind. “I finally mastered my flip,” he told me with big, wide eyes. I thought I should say something about work and the appropriateness of time and place, but instead I kept my mouth shut and watched as he demonstrated his “mastered” flip. “He looked like he needed a break,” I heard from Tucker’s boss who’d walked up behind. And I smiled, knowing that no matter how big Tuck gets, a part of him will always remain a little boy at heart. You can click on the picture to watch the 40 second video. Note the fist pump at the end!